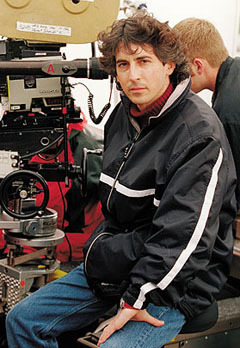 As a screenwriter and director, Payne has had remarkable success making intellectually challenging, character-driven movies within a studio system that usually aims for the lowest common denominator. His films are funny but with a serious side, with plots that include tough political or moral questions pondered by recognizably real characters. Payne's career is still in its early stages, but he has already been compared with Preston Sturges, as a gifted storyteller focused on the realities of life in real America. His first film, made as his thesis at UCLA film school, was The Passion of Martin, a haunting look at romantic obsession. Unlike most student films, it garnered attention from film professionals, was screened at Sundance, and got Payne's foot in the door in Hollywood. His theatrical films include the abortion farce Citizen Ruth (with paint-huffing Laura Dern), the high-school political exposé Election, the past-midlife crisis About Schmidt, and the road trip through wine country Sideways. For extra income, Payne also contributed to the screenplay for Jurassic Park III. He was also an executive producer on The Assassination of Richard Nixon. In 2004, Payne wrote a think piece in Variety, in which he chastised the studio system for churning out decades of forgettable films, and called on the studios to "invest in a greater number of less expensive films and enjoy the profits of volume rather than always starving the small and medium films in order to feed the increasingly mercurial "tentpole" beast." "For some 25 years, we've had American movies but not movies about Americans. For 25 years we've largely been making not films but rather glorified cartoons which can be as easily digested in Omaha as on a bus in Thailand; films whose principal message is, We need your money to keep our stock price up; films that exploit banality and violence as come-ons to the lowest angels of our nature; films based on formula so they can be consumed as readily and predictably as McDonald's hamburgers. We've turned away from the need and utility of art in favor of impersonal product to maximize profits and at the tremendous, tragic expense of our culture."